A 291-day-old retina. Our ability to see colors develops in the womb. Now scientists have replicated that process, which could help accelerate efforts to cure colorblindness and lead to new treatments for diseases. The discovery, published Thursday in the journal Science, could help accelerate current efforts to cure colorblindness. It could also lead to new treatments for diseases including macular degeneration, the leading cause of vision loss. "It's important that we understand how nature controls the development of the retina so we can understand better why things go wrong in disease and how we can treat them," says Steven Becker, a scientist at the National Eye Institute. The newly published findings are a step in that direction, says Becker, who has no connection to the research. The development of color vision in people has been difficult to study because it usually occurs in the womb — and out of sight. But two scientists at Johns Hopkins University thought they might find some answers using retinas grown in the lab. 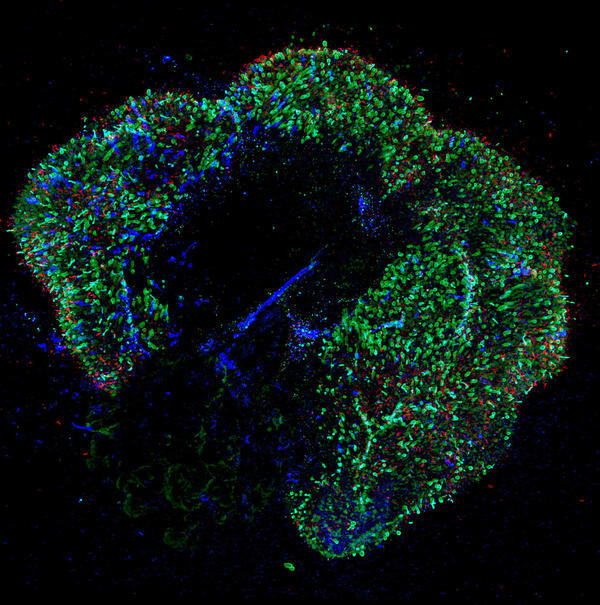 These "retinal organoids" have been around for a few years but are difficult and tedious to grow, says Kiara Eldred, a graduate student at Hopkins who is the paper's first author. It takes up to a year to turn a batch of immature retinal cells into a functioning organoid. "For the first week of their life, I take care of them every day," Eldred says. After a couple of weeks, she says, the cells become "a little bit more independent." And with luck, these clusters of immature cells develop into a 3D structure that "looks and acts like a developing retina that you would see in a baby," says Bob Johnston, Eldred's boss and an assistant professor in the biology department. Johnston's lab had been studying vision in flies. But he and Eldred saw a chance to try something much more ambitious. "We discussed this crazy idea of: Could we use these human retinal organoids to study how we get the different color-sensing cells in our eyes?" Johnston says. Using human cells was key because you can't study how humans see color in a fly, or even a mouse. "Mice don't sense red," Johnston says. "They don't have these red-detecting cells. So we really have to study this in human tissue to get any insight into how it works." Johnston and Eldred knew that in a human fetus, cells that detect blue light appear first. Then come cells that respond to red and green light. And research on animals suggested that the thyroid hormone was involved in the development of these color-sensing cells, called cones. So Johnston had Eldred conduct an experiment with immature retinal cells. "I added thyroid hormone to the dish during their development, and we got more red-green cones developing in those organoids," she says. "We got really excited because we were on to something." It would take years and many more experiments to confirm that the thyroid hormone was actually triggering the emergence of color vision. And the team still hasn't figured out what causes some cones to go on to become even more specialized by detecting only red or only green. But Johnston says his lab is now preparing to take on two new goals. "One is to restore color vision to people that are colorblind," he says. What his lab is learning, he says, could help speed an existing effort to use gene therapy to cure colorblindness. The lab's second goal is to use retinal organoids to better understand diseases including glaucoma and macular degeneration, a leading cause of vision loss. Macular degeneration affects the macula, an area of the retina that provides high-resolution vision. The condition has been hard to study, though, because mice don't have a macula. So Johnston hopes to learn more by having his lab create macular organoids. There's growing optimism among scientists that new treatments for retinal diseases will emerge from such efforts, Becker says. Initially, he says, researchers had doubts about whether a retina grown in a dish could mimic the real thing. But studies like this one on color vision, he says, "show that the similarity is quite high." To encourage scientists to develop more retinal organoids, the National Eye Institute is sponsoring a scientific competition with $1 million in prizes. Scientists think they have answered a critical question about how our eyes develop the ability to see colors. It involves a process that usually takes place in the womb and out of sight. But as NPR's Jon Hamilton reports, researchers got around that obstacle by growing human retinas in a dish. JON HAMILTON, BYLINE: Growing a human retina requires a lot of patience. KIARA ELDRED: It takes between seven months and a year. HAMILTON: Kiara Eldred should know. She's a graduate student in a lab at Johns Hopkins University. And for the past few years, it's been her job to keep dishes of immature retinal cells alive. ELDRED: So for the first week of their life, I take care of them every day. And then after about 15 days, I can change the media on them every other day. So they're (laughter) a little bit more independent. HAMILTON: Eldred's boss, Bob Johnston, says these clusters of cells develop into a 3D structure known as a retinal organoid. BOB JOHNSTON: It really looks and acts like a developing retina that you would see in a baby. HAMILTON: So it's able to detect both light and color. Johnston is an assistant professor in the biology department. And until a few years ago, his lab had been studying vision in flies. But Johnston and Eldred saw a chance to try something much more ambitious. JOHNSTON: We discussed this crazy idea of, could we use these human retinal organoids to study how we get the different color-sensing cells in our eyes? HAMILTON: Johnston says using human cells was key because you can't study human color vision in a fly or even a mouse. JOHNSTON: Mice don't sense red. They don't have these red-detecting cells. And so we really have to study this in developing human tissue to get any insight into how it works. HAMILTON: Johnston and Eldred knew that in a human fetus, cells that detect blue light appear first. Then come cells that respond to red and green light. And research on animals suggested that thyroid hormone was involved in the development of these colors-sensing cells called cones. So he had Eldred do an experiment. ELDRED: I added thyroid hormone to the dish during their development, and we got more red-green cones developing in those organoids. And so we got really excited. HAMILTON: It would take years and many more experiments to confirm that thyroid hormone was actually triggering the emergence of color vision. And the team still hasn't figured out what causes some cones to go on to become even more specialized by detecting only red or only green. But Johnston says his lab is ready to take on two new goals. JOHNSTON: One is to restore color vision to people that are colorblind. But perhaps just as important, there is a disorder called macular degeneration that's the leading cause of vision loss. HAMILTON: Macular degeneration affects the macula, an area of the retina that provides high-resolution vision. The condition has been hard to study, though, because mice don't have a macula. So Johnston hopes to learn more by having his lab create macular organoids. Stephen Becker of the National Eye Institute says studies like the one at Johns Hopkins are helping to resolve doubts about whether retinas grown in a dish can truly mimic those in a human eye. STEVEN BECKER: These studies show that the similarity is quite high. HAMILTON: And Becker says the Eye Institute is trying to encourage the creation of more retinal organoids by sponsoring a scientific competition with a million dollars in prize money. BECKER: It's important that we understand how nature controls the development of the retina so that we can understand better why things go wrong in disease. HAMILTON: And how to develop better treatments. The new research appears in the journal Science. Jon Hamilton, NPR News. (SOUNDBITE OF KATE SIMKO'S "THE CREATIVE PART") Transcript provided by NPR, Copyright NPR.